Sam's Club Membership Giveaway & Gift Card Offer | A Savings WOW! 2. Meat – ground beef, steaks, ribs, and more are fresh. You can save money buy buying them in bigger packages. 3. Snacks – they often have instant savings specials on snack items. For example, there is an instant savings deal right now where you get two bags for the price of one on Boom Chicka Pop (a favorite in our household). 4. Cakes – their cakes are so moist and delicious that we get rave reviews whenever we serve it for a party or order cupcakes to bring to a party or event. You can select from a variety of designs to customize your cake or cupcakes and you usually only need to order it 24-hours before your desired pick-up time. 5. Medications – one thing that you can definitely save money on at Sam’s Club are medications. They carry a wide variety of over-the-counter medications. You can also have your prescriptions filled there. Sam’s Club Plus memberships also get five free prescriptions. 6. Gift Cards – they have a wide selection of gift cards at a discount. They are great for gifts or for your personal use. We know people that purchase the Disney gift cards from there at a discount to use towards their Disney vacations. The savings can add up! With our Sam’s Club Plus membership, we have been able to save a lot of money, enjoy the extra hours open only for Sam’s Club Plus members, and earn cash back. Sam’s Club is rolling out programs and tools to increase the convenience of shopping at their stores like self-checkout, online ordering/shipping to store for pickup and the Scan and Go app. They also offer easy online re-ordering, so you can have products you use regularly shipped, quickly and easily, to your house. The Sam’s Savings $45 membership is the lowest among warehouse store membership fees. With this coupon, you can get a $20 gift card when you sign up for membership, making it an even better value! Enter to win one a Sam’s Club Sam’s Plus membership! 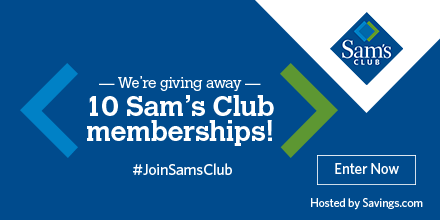 Ten (10) winners will each receive a Sam’s Club Sam’s Plus membership during this #JoinSamsClub giveaway. Enter your email address on the form at the top of the page at Savings.com. The winners will be chosen through a lottery drawing and notified on Friday (6/2) via the email address they used to enter. See complete Official Rules for entry instructions, full prize descriptions, restrictions and other important details. Check out more tips on saving money at Sam’s Club!